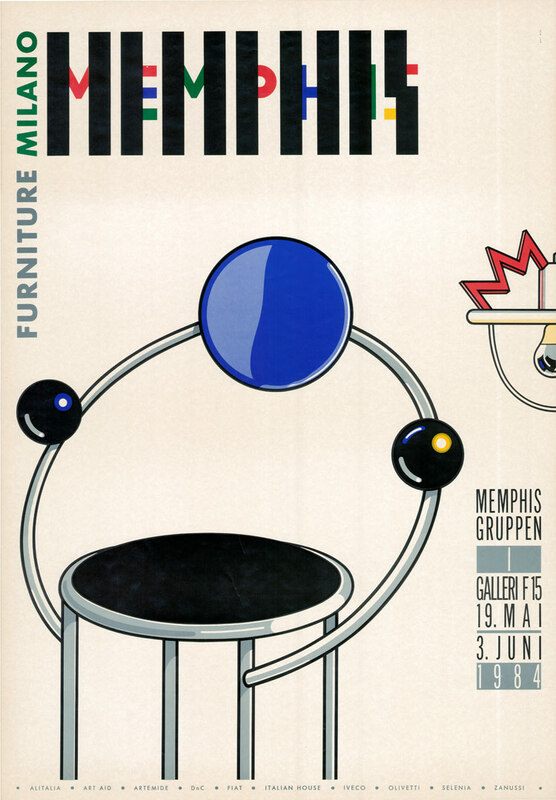 Of the many cultural tributaries that flowed together into what we now think of as the visual aesthetic of the 1980s, one of the most prominent must be the Memphis Group. 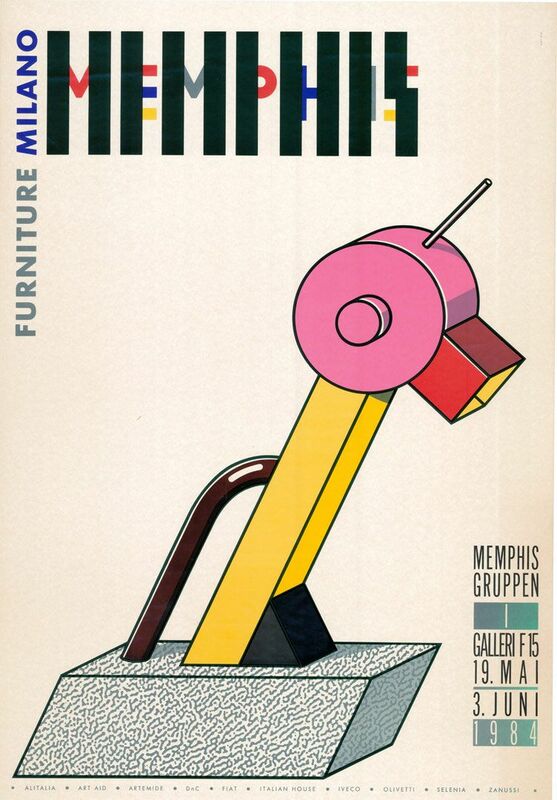 Convened in 1981 by Austrian-born architect and designer Ettore Sottsass, Memphis was a collective that—incongruously, for something that seems so violently of its times—took its name from the lyric of a Bob Dylan song that had been playing during one of the group’s initial meetings. According to one version of the group’s creation myth, the needle had stuck at one line that, none of those present being sober enough to do anything about it, became the name of the nascent initiative. Ettore Sottsass was at that point already one of the more influential Italian and international designers of the 20th century. His father, Ettore Sottsass Senior, was also an architect and a member of the Italian Movement for Rational Architecture, which rejected decoration and held that architecture should be based upon a scientific approach to problems, allowing a structure’s materials and purpose to dictate spaces and form. In the interwar years, the Rationalists had enjoyed some official commissions from Italy’s Fascist government as they attempted to position themselves as the regime’s house style, but had eventually lost out to the more classical work of the National Union of Architects and the dynamic, lunatic beauty of Futurism. After graduating from Turin University in 1939, Sottsass was called up by the Italian army, captured, and spent the rest of the war interned in labor camps in Montenegro. When the war was over, he worked briefly with his father before opening his own office. In 1957, he became what we would now call an art director for radical Tuscan furniture design company Poltronova, for whom he would produce more than fifty projects over the following decades. Some of these—pieces like 1979’s Svincolo lamp—hint at motifs that would later explode into autonomous life in Memphis, as does the pattern he designed in 1978 for laminates company Abet Laminati, Bacterio, which would go on to become one of the abiding ’80s textures. 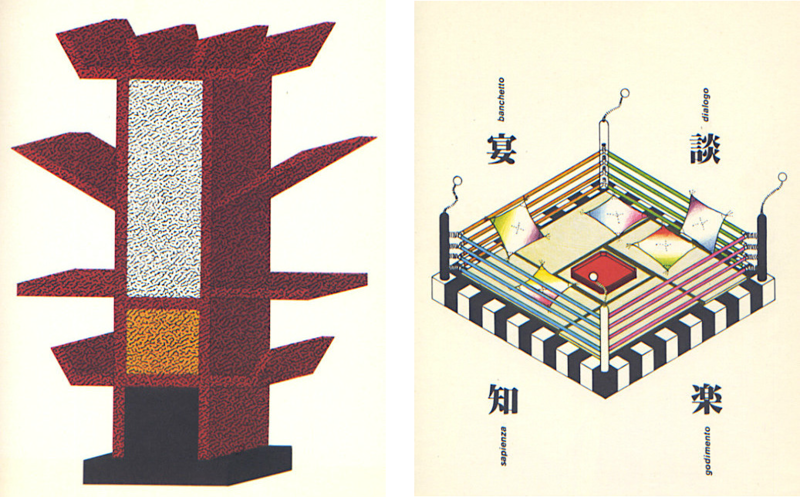 Sottsass took up a side gig in 1958 working as a design consultant for the progressive typewriter, calculator, and electronic products company Olivetti. Over the next 30 years he created a huge number of items for them, ranging from a 40-person audiovisual jukebox and the company’s famous Valentine portable typewriter to the Elea 9003 mainframe computer. Many of these products would come to be regarded as milestones in the history of industrial and visual design. 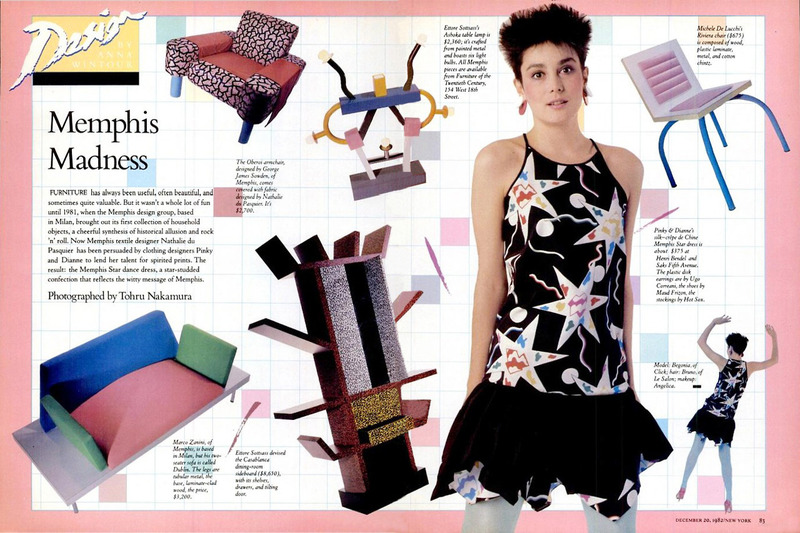 Some of Sottsass’s interior design work from this period resembles assemblages of random found materials, like his Tower Furniture from the early ’60s, and post-lapsarian worlds make an appearance in his 1972 illustrated article for Casabella magazine, The Planet as a Festival, created with his then-wife Fernanda Pivano. The Planet as a Festival, which owes more to the colorful delirium of Hugo Gernsback magazine covers (an often unmentioned debt to sci-fi artwork being a recurring feature in the work of radical architecture practices of the day) than to the work of Mies Van der Rohe, describes a world inhabited by a humanity freed of the need to work, a world where design and architecture take on a playful, mystical artisan quality. Nine years later, in Milan, Sottsass assembled the group of 20 or so like-minded Italian, Japanese, Spanish, French, American, and British creative types who would become Memphis. It was decided that the collective would attempt to break with the prevailing concepts of “good taste” imposed by the international modernist style. It would be garish, playful, even annoying—an irreverent, knowing cocktail of the detritus of the pop culture of previous decades filtered through a love of comics, garish kitsch, and geometric forms; a postmodern attack upon the Bauhausian demand that form follow function. 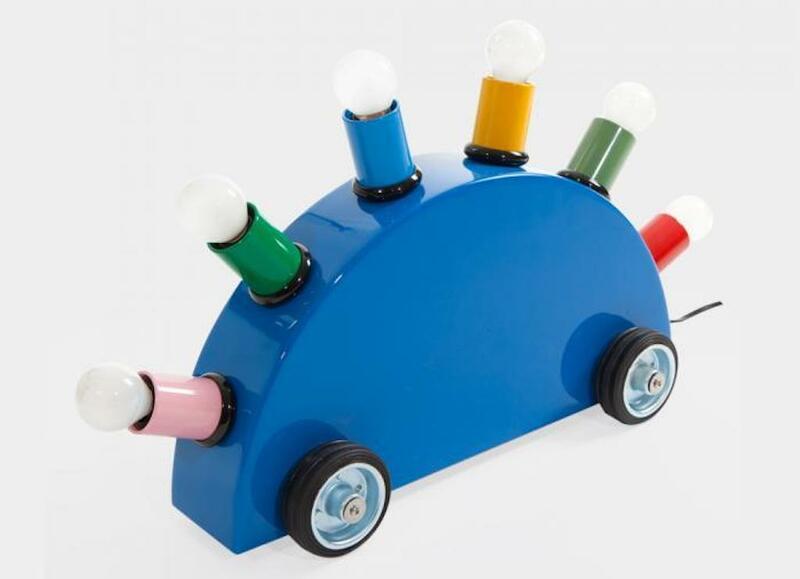 And so, led by Sottsass—and possibly fueled by alcohol—Memphis set off on a cannibalistic romp through the pop culture and fine art of the previous sixty years: futurism, surrealism, constructivism, abstract art, Art Deco, Pop Art, Hollywood glitz—all as seen from a distinctly postmodern perspective. The various members of Memphis each brought their own preoccupations to the table, creating something that both ironically referenced the past while seeming at the same time strangely futuristic. They also drew upon non-Western cultures as a source of inspiration. Memphis’s work abounds with hints of Japanese Ukiyo-e art and American Tiki culture, as well as the influence of African, Egyptian, Indian, and other non-Western cultures. 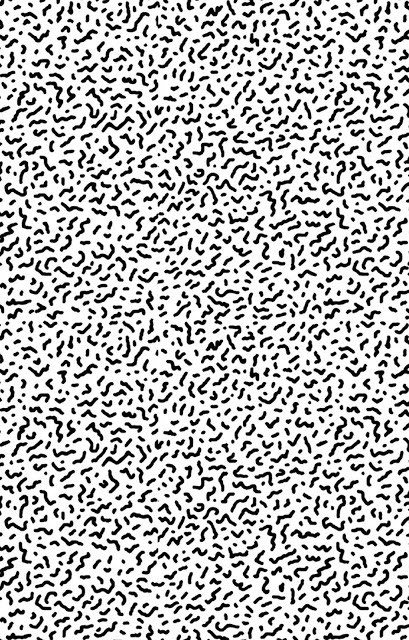 The origins of Bacterio‘s myriad squiggles lay not only in the microscopic image of bacteria but also in the facade of the Meenakshi Temple, which Sottsass had sketched while touring India. Perhaps the clearest example of this jackdaw approach to other cultures was the contribution of French designer Nathalie Du Pasquier, who was responsible for creating many of the memorable patterns which would become synonymous with Memphis and, subsequently, with the ’80s themselves: collages of bold and childlike motifs and colors, which brought together incongruous contrasts of geometric forms and spontaneous doodles, squiggles and blots that seemed to intentionally draw attention to their own vibrant, discordant nature. It was imagery that harked back to what Du Pasquier had seen when traveling through French-speaking Africa, where, she says, she “noticed for the first time the power of pattern.” Though it can be difficult to make it out through the fog of endless recycling that Memphis has undergone, much of their work carries these echoes of “modern primitive,” evoking fetishes or totems—a grab-bag approach that, from the perspective of today, smacks a little of postcolonial cultural appropriation. The Memphis style paralleled—or drew upon—other currents that were bubbling under the surface of the subculture, perhaps most clearly visible in the aesthetic of bands like the B-52s and Devo or the films of director John Waters, who often used the imagery of past decades to subvert, critique, and parody the modern world. Similar things were happening in comics with the Style Atome, a postmodern revisitation of the “Atom Style,” which took its name from the Atomium built for the 1958 Brussels World’s Fair. The Style Atome had characterized the work of artists like Joost Swarte, Ever Meulen, Francois Thomas, Yves Chaland, and Serge Clerc since the late ’70s, and their work was frequently featured in the “highbrow” European and American comics of the day such as Totem, Pilote, Raw and Metal Hurlant—full of expertly contoured ligne claire outlines, matt colors with little shading or hatching, and absurdist renderings of past style. 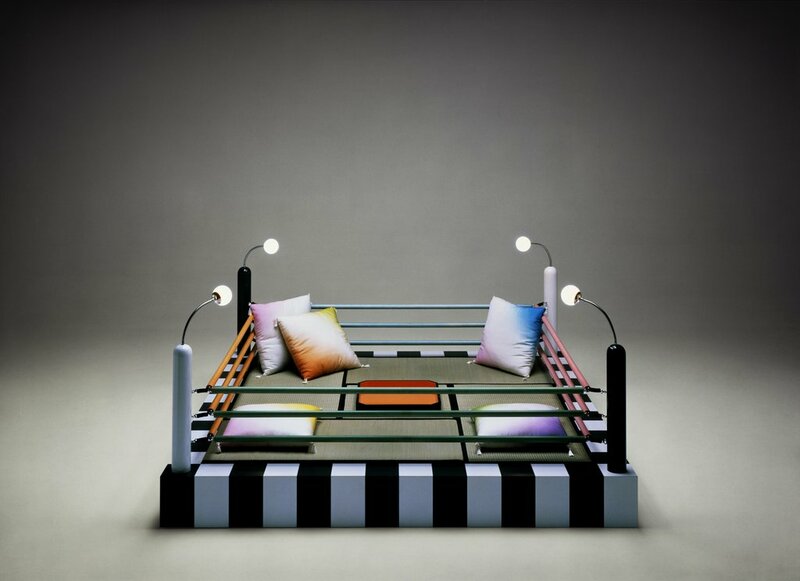 Memphis made its debut at the 1981 edition of Milan’s annual Salone Internazionale del Mobile furniture fair—an event then renowned for its dowdy Mitteleuropean elegance—with a collection that included pieces such as Sottsass’s Carlton Room Divider, Masanori Umeda’s Tawayara boxing ring seating unit, Martine Bedin’s Super Lamp, George Sowden’s Oberoi armchair, and Du Pasquier’s fabrics, which would become icons of the group’s iconoclastic approach. Design pundits and critics were scandalized by what they saw as the tacky vulgarity on display, but the show was a huge and unexpected success with the public, and the style—more often in the hands of the company’s imitators than of Memphis itself—rapidly began to impress itself upon the popular imagination. It’s certainly no coincidence that Memphis appeared at a time when neoliberalism was on the rise and tensions between world superpowers were the highest they had been since the 1950s: on the one hand, there was a new class of people on the up, keen to find accoutrements to symbolize and enshrine their new wealth and standing; and on the other, there was a craving for color and diversion, because the way things were going, it was looking increasingly like there might not be much time left. Looking back, it’s hard to tell if this was actually true, just as it’s hard to tell to what extent Memphis was genuinely a prescient driving force of the themes we now associate with the ’80s, or merely an inevitability which ended up symbolizing it. Memphis certainly weren’t the only outfit working those motifs, though perhaps they were the best at synthesizing their diverse influences into something concrete—something that was capable of capturing the spirit of the times in a way that appealed to quite distinct demographics, allowing the work to evoke both countercultural, new wave eccentricity and aspirational yuppie emptiness. A 1982 New York Magazine feature on Memphis. 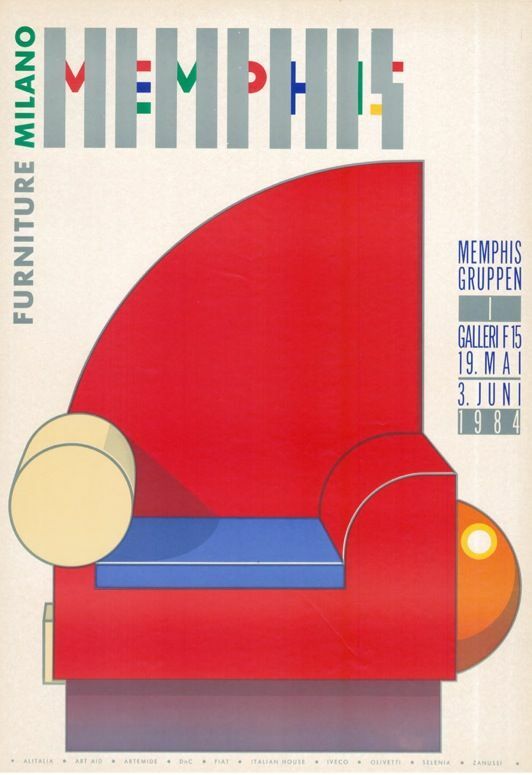 An article in a 1982 GQ magazine speaks of the group as “balancing ancient Egypt against the freeform fifties, juxtaposing Art Deco revivalism with Neo-classical visual gags, in addition to sending up both Bauhaus and the Beaux-Arts,” and maybe that, as much as anything else, is Memphis’s legacy: an irreverent summary of the sixty years that had preceded it, presented with deliberate artlessness so as to emphasize its artificiality. 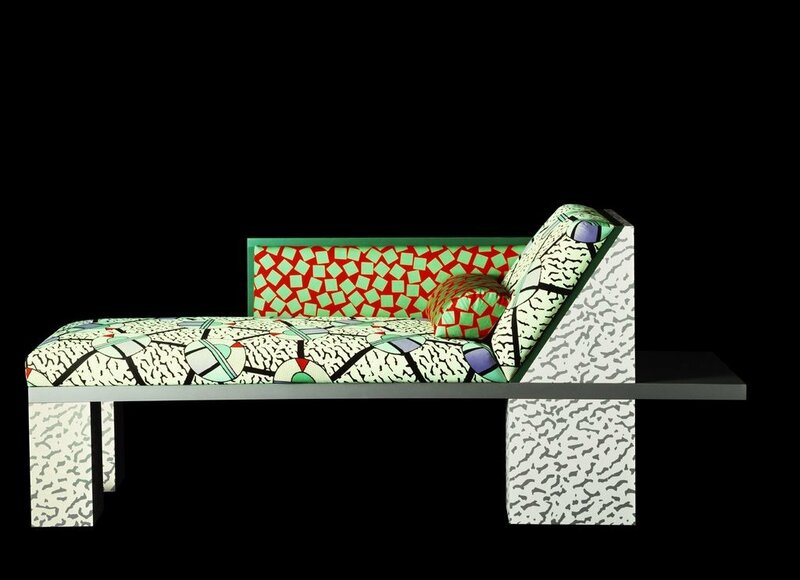 As the ’80s moved on, though, the original intentions of the Memphis group were forgotten, co-opted, leaving only the hollow husks of its aesthetic in the hands of plagiarists, deprived of the optimistic, rebellious verve that animated the original. Overfamiliarity had turned a vision that aimed to make drab everyday life a riotously colored comic book into just another worn-out symbol of its time—one as dreary as the international style once seemed to its creators. Sottsass, who died in 2007, once said that he didn’t believe any really powerful idea lasted long, and this was certainly true of Memphis’s original incarnation: he himself left in 1985, citing differences with the company’s moneymen. Despite their relatively brief window of activity, though, and the fact that Memphis’s costly originals never sold in huge numbers at the time, their influence would echo through the popular culture of the ’80s and early ’90s like a bright yellow foghorn mounted on a green pedestal.